through our easy to use control panel! compatible with industry-leading SEO plugins! 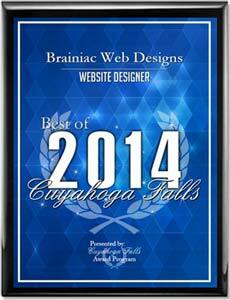 Award Winning Akron Web Design and SEO! 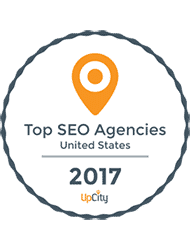 and a TOP ranked Ohio SEO Agency in 2017! Why Choose Our Akron Web Design Team? 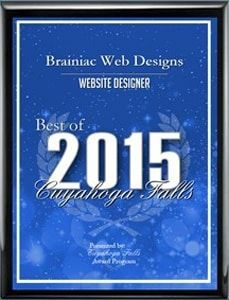 In 2014 and 2015, our Akron Web Design company, Brainiac Web Designs, has been selected as the best web design company in Cuyahoga Falls by the Cuyahoga Falls Award Program! Various sources of information were gathered and analyzed to choose the winners in each category. The Cuyahoga Falls Award Program focuses on quality, not quantity. Winners are determined based on the information gathered both internally by the Cuyahoga Falls Award Program and data provided by third parties. In 2017 we were selected as a Top SEO firm in Ohio. You may read more here. Brainiac Web Designs was started in 2007, upon Doug’s return home from a fifteen month tour of Iraq and surrounding areas with the US Army. Our Akron web design team started as Mastermind Web Designs LLC, and still officially operates under that name, although now goes by Brainiac Web Designs. While in Iraq, Doug wanted to learn a skill in his free time, so instead of doing nothing but hitting the weights and watching DVD’s like most other soldiers, he utilized a website called Books For Soldiers, and started reading all about web design, SEO, responsiveness and more. Here we are, almost a decade later, still in business and stronger, smarter, and more advanced then ever! Any time, day or night, it makes no difference. As a client of Brainiac Web Designs, you will have personal cell phone numbers, emails, and other contact information. We do not operate under regular business hours. 2AM on a Saturday and you need some help? Don’t hesitate to give us a call or shoot us a text! We are happy to help, and the customer’s happiness is our number one concern! Using Social Media Marketing (SMM) can enable your business to reach more customers. If implemented correctly, marketing with social media can bring remarkable success to your business! Our websites are built up to the highest quality responsive code, ensuring that your product looks great on every mobile device. Don’t get penalized by Google for not being mobile friendly! Our websites use valid HTML5 code, and employ only the best and most up to date SEO practices! Combine that with only the best content writing and highest quality graphics and coding, and you’ve got Premium Quality! Brainiac clientele rave about the quality of our customer service. As a customer of ours, when you need something, the day and time are irrelevant. Day or night, weekday or weekend, we are there for you! Our client’s happiness is our number one priority. Since Google has unleashed their newest major algorithm update, Search Engine Optimization (SEO), now goes hand in hand with responsiveness. Brainiac Web Designs only practices the highest quality, white hat SEO methods! Doug did a great job on multiple websites for us. He performed photography as well as design/development. His photos were clean & neat with exactly the proper amount of lighting. He’s was easy to work with and responsive to our needs. Very good value for your money!!! A review of our work will be posted here soon. Doug and the web design team at Brainiac Web Designs are amazing to work with. They are always prompt in replying to my requests, and get updates to my website completed in a timely fashion. I can’t recommend the web designers at Brainiac Web Designs more highly. We want to give a big thanks to Brainiac Web Designs for doing an awesome job on our website (www.Flashitllc.com). We know it wasn’t an easy task but you were able to create exactly want we needed! and leave yours on our social media pages!